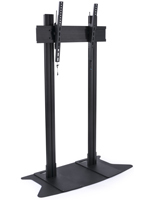 These vertical TV floor stands display flat panel monitors in a portrait orientation. 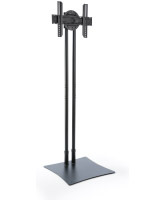 The racks are made of strong metal and feature a black and silver finish that goes with any décor. 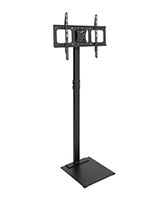 The LCD floor stands can hold 26"-52" flat panels in a portrait orientation. 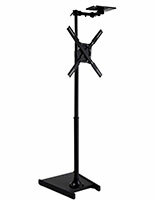 The holder's metal frame is hollow to manage cables and cords and keep them out of sight. 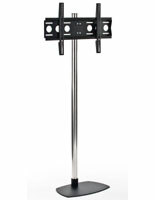 Each of the stands has VESA holes for sizes ranging from 100x100 to 1200x400. 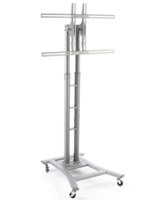 The LCD displays stand 68" tall and have a small footprint for placement in any location. 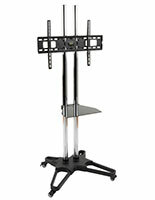 31.5" x 68.0" x 17.5"